Freescale's MMA8452Q is a smart, low-power, three-axis, capacitive micro-machined accelerometer with 12 bits of resolution. It's perfect for any project that needs to sense orientation or motion. 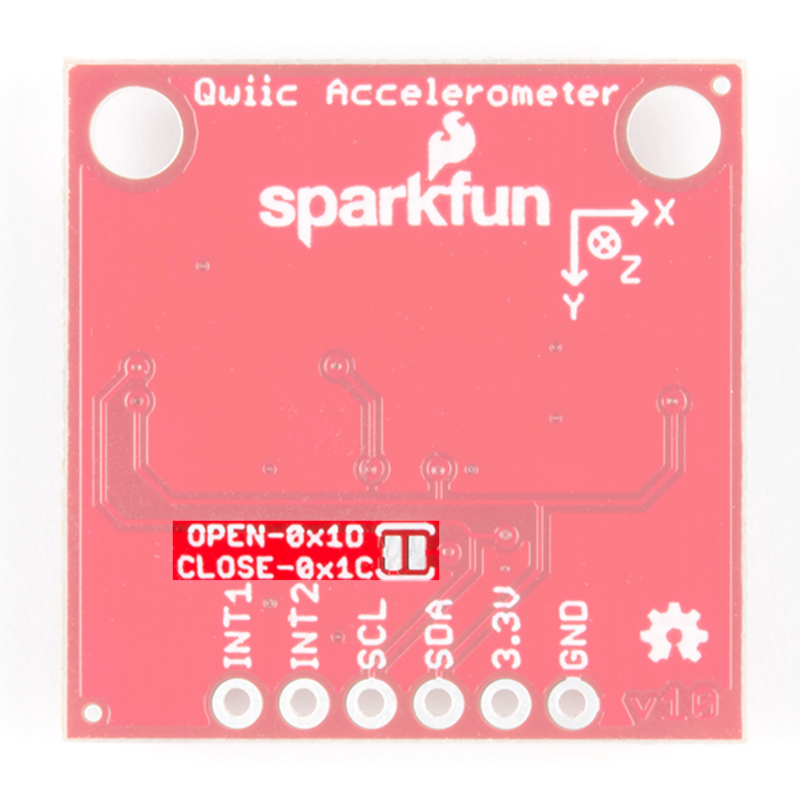 We've taken that accelerometer and stuck it on a Qwiic-Enabled breakout board, in order to make interfacing with the tiny, QFN package a bit easier. 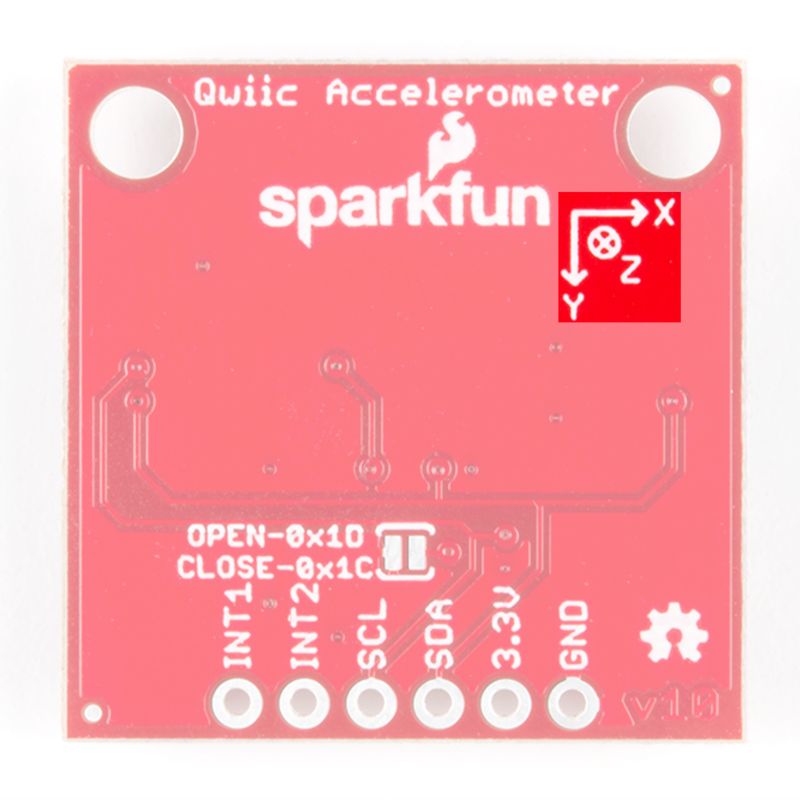 It's part of SparkFun's Qwiic system, so you won't have to do any soldering to figure out how things are oriented. The MMA8452Q is a rock-solid, feature rich, 3-axis accelerometer. It supports three, selectable sensing ranges: ± 2g, 4g, or 8g. It also sports features like orientation detection, single and double-tap sensing, and low power modes. It's a digital sensor -- communicating over a Qwiic enabled I2C interface -- so you'll get reliable, noise-free data over a Qwiic enabled I2C port. 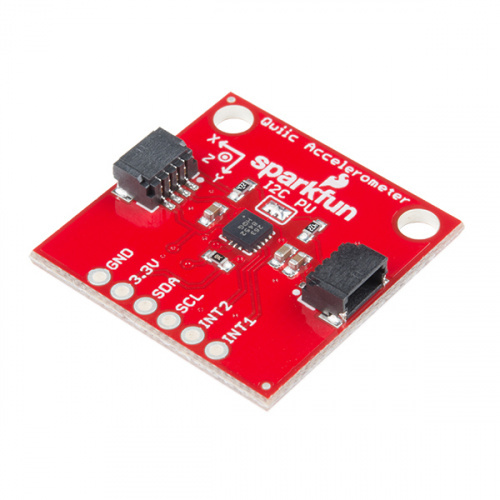 In this hookup guide, we'll connect our sensor up to our microcontroller of choice and read the X, Y, and Z accelerometer channels to figure out how we are accelerating in those directions. Then, we'll figure out how to use orientation detection to figure out what orientation the sensor is in. You will also need a Qwiic cable to connect the shield to your accelerometer, choose a length that suits your needs. Let's look over a few characteristics of the MMA8452Q sensor so we know a bit more about how it behaves. The characteristics of the available pins on the MMA8452Q are outlined in the table below. INT2 Interrupt 2 Output Programmable interrupt — can indicate data ready, orientation change, tap, and more. INT1 Interrupt 1 Output Programmable interrupt — can indicate data ready, orientation change, tap, and more. The Qwiic Accelerometer has onboard I2C pull up resistors; if multiple sensors are connected to the bus with the pull-up resistors enabled, the parallel equivalent resistance will create too strong of a pull-up for the bus to operate correctly. As a general rule of thumb, disable all but one pair of pull-up resistors if multiple devices are connected to the bus. If you need to disconnect the pull up resistors they can be removed by removing the solder on the corresponding jumpers highlighted below. There is an additional jumper on the back of the board that allows the I2C to be changed from the default 0x1D to 0x1C if you have multiple accelerometers on the same I2C bus. 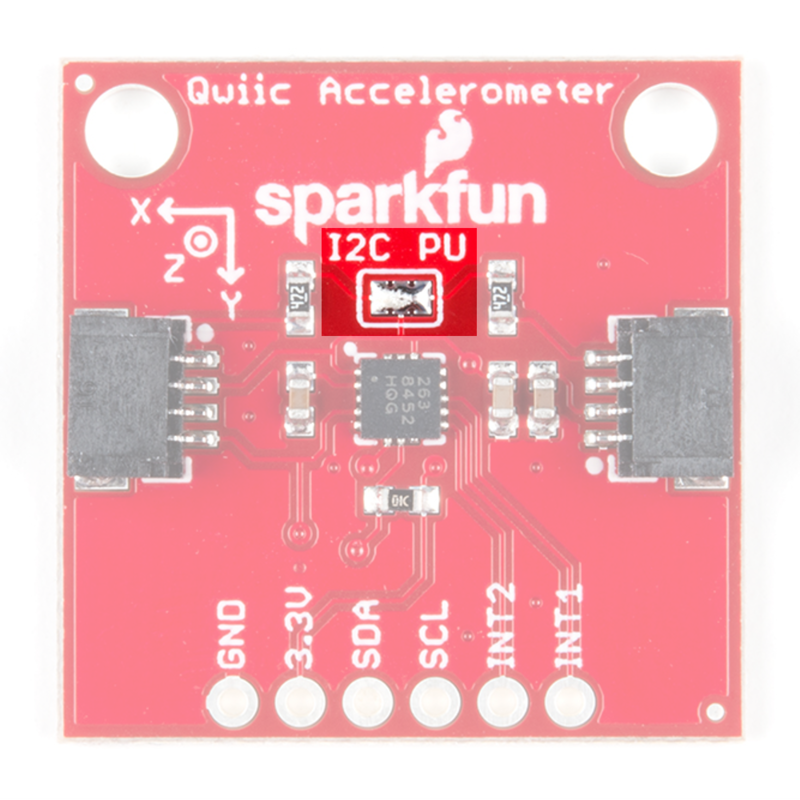 However, if you have more than 2 accelerometers, you'll need the Qwiic Mux to have them all on the same I2C bus. The jumper is highlighted below. Normally open, the jumper sets the I2C address to 0x1D. Closing the jumper with solder will give an I2C address of 0x1C. Also be sure to check out the labeling on the back of the board that indicates the orientation of the positive X, Y, and Z axes so you know what exactly your data means. If you haven't yet assembled your Qwiic Shield, now would be the time to head on over to that tutorial. 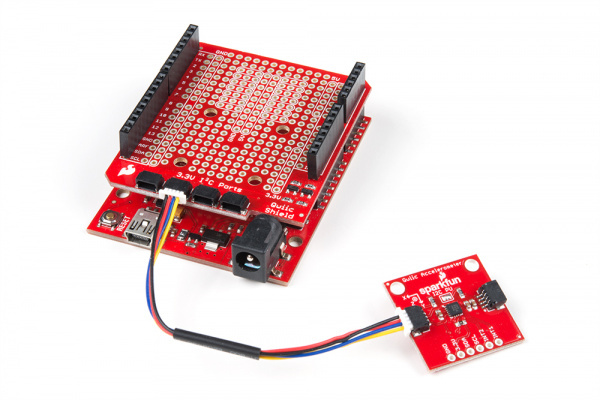 With the shield assembled, Sparkfun's new Qwiic environment means that connecting the sensor could not be easier. Just plug one end of the Qwiic cable into the Accelerometer breakout, the other into the Qwiic Shield of your choice and you'll be ready to upload a sketch and figure out how your board is moving around. It seems like it's too easy to use, but that's why we made it that way! We've written an Arduino library to make interfacing with the MMA8452Q as easy as can be. Click on the button below to download the library. Or you can grab the latest, greatest version over on the library's GitHub repository. Once you've installed the SFE_MMA8452Q library, restart Arduino. Then go to File > Examples > SFE_MMA8452Q > MMA8452Q_Basic to open the example sketch. Once you've set your Board and Serial Port, upload the sketch to your Arduino. Then open the serial monitor. You'll begin to see acceleration values stream by, in addition to some information about the sensor's orientation. Try moving the sensor around to change those values. If it is motionless, flat on the desk, then an acceleration of 1g should be felt on the z-axis, while the others feel around 0. Test the other axes by rotating the board and making them feel the pull of gravity. 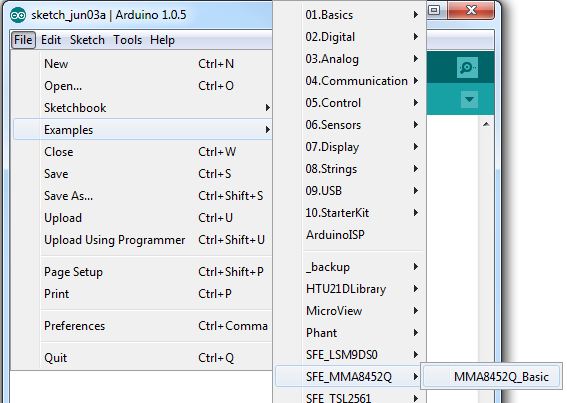 Here are some tips on using the MMA8452Q Arduino library so you can embed it into an Arduino sketch of your own. The library also requires that you include Wire.h in your sketch. Make sure you include that before you include the SFE_MMA8452Q.h file. But if you've left the address jumper untouched (meaning the "SA0" pin is connected to VCC), you can call the default (no parameter) constructor shown earlier. Finally, in the setup() function of your sketch, you can initialize the accelerometer using the init() function. The init() function verifies communication with the accelerometer, and sets up the full-scale range and output data rate. Scale can be either SCALE_2G, SCALE_4G, or SCALE_8G. The "odr" variable can be either ODR_800, ODR_400, ODR_200, ODR_100, ODR_50, ODR_12, ODR_6, or ODR_1, respectively setting the data rate to 800, 400, 200, 100, 50, 12.5, 6.25, or 1.56 Hz. Once you've set the accelerometer up, you can immediately start reading the data coming out of the chip. Reading and using the values is a two-step process. First, call the read() function to pull in the values. After you've called the read() function, you can use either of two sets of values to use the data. Reading from the x, y, and z class variables will return a signed 12-bit integer read straight out of the accelerometer. Or, if you want a value with physical units, you can use the cx, cy, and cz class variables. These are the calculated acceleration values read out of the accelerometer; they'll be in units of g's. Remember! Those variables are only updated after the read() function is called. Make sure that happens before you start using acceleration values. The MMA8452Q has all sorts of nifty, extra features, one of which is orientation detection -- it can estimate if it's being held in landscape mode, portrait mode, or flat. 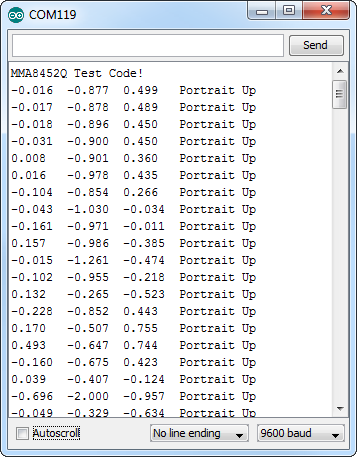 To read the portrait/landscape data from the accelerometer, use the readPL() function. This function returns a byte, which will either be equal to PORTRAIT_U, PORTRAIT_D, LANDSCAPE_R, LANDSCAPE_L, or LOCKOUT. As in the example above, you can use if or switch statements to check which orientation your accelerometer is in. Qwiic MMA8452Q Schematic (PDF) -- PDF schematic of the Qwiic MMA8452Q breakout board. Qwiic MMA8452Q Eagle Files (ZIP) -- PCB design files for the Qwiic MMA8452Q Breakout board. MMA8452Q Datasheet (PDF) -- Loads of information about the MMA8452Q's electrical characteristics, registers, communication specifications, and more. Qwiic MMA8452Q GitHub Repo -- Design files and example code all related to the MMA8452Q. Arduino Library - Arduino library for MMA8452Q. Photon Library - Photon library for MMA8452Q.